When you hire a catering service, you’re hiring professionals who make and serve food. How are catering prices determined? For starters, what are the foods involved? For instance, some people have very specific needs for their parties or events, such as gluten-free and/or “all organic” items. If a person requests something like grass-fed beef, for example, the caterer will probably have to check with their supplier before purchasing it, to see how much the supplier charges. Furthermore, the number of guests will obviously affect pricing… sometimes caterers can get discounts from their suppliers when they “buy in bulk,” so the more people attending, the better deal everyone gets. Pricing is also determined by what is ultimately wanted– just entrees versus appetizers and entrees can affect the price.Other costs factored in can then include things like napkins, tablecloths, chairs and dishes used to serve the food. And then there are workers/servers to pay, too. A typical caterer has to be good with math, because he or she has a lot of numbers to deal with. Adding up fixed costs, the caterer can then multiply the per person charge by the number of people, and add these numbers together to give you a price quote for the job. Obviously, profit must be factored in as well, since that’s the way a business stays in business. If you’re looking for a diversified off-premise party and event catering company in Bensalem, PA, R & R Caterers can do the job. 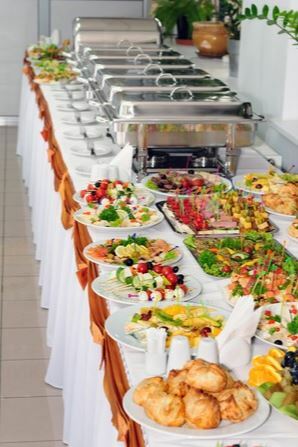 With delicious food and impeccable service, R & R Caterers has built a strong reputation in the Philadelphia region over the years. Please call 215-638-7376 for more information; R & R can help make your party or event one to remember!